You can't ski every day, all day. So there's snow tubing when you're ready for that break. This is a kid and family fun center with snow tubing, a play area, mini-snowmobiles and beginner ski hill. Summer and winter activities, such as skiing, snowmobiling, tubing, alpine coaster, and more. Discount packages available! This ski resort offers snowboarding, skiing, and snow tubing in the winter and scenic chairlift rides, hiking, and disc golf in summer. Tubing is great for kids and those who still think they are. Grab a giant inflatable ring, sit in the center, hang onto the rope tow and when you reach the top, plunk yourself onto a fast track straight down the hill. Laps at a nearby snowtubing park are some of most fun escapes you can have. The wahoo factor at Gorgoza Park near Park City (on the south side of I-80) tips the scales for winter playgrounds. Legs dangling over an inner tube, zooming down one of seven slick, snow-covered tracks, hot chocolate in the warming yurt; whether you go during the day or after sunset, your time at Gorgoza is a hoot. Gorgoza also has mini snowmobiles for those too young to ride the tubes and a "frosty fort" for snowplay. The Park is open daily throughout the winter. It's a bit more remote but snowtubing at Soldier Hollow in Midway is worth the drive. The former Olympic venue outside of Heber, Utah, sports the longest tubing lanes in Utah. Guests can race the 1,200 feet during the day or night and a sound system keeps the airwaves full of that party atmosphere. Kids under three have a small slope for "junior tubing". Unlike Gorgoza, Soldier Hollow Tubing limits ticket sales to keep the crowd level from broaching on the insane. Make sure you call ahead to reserve your tickets especially on Saturdays and holidays. You'll want to check to make sure the attraction isn't booked for a private party before driving over. 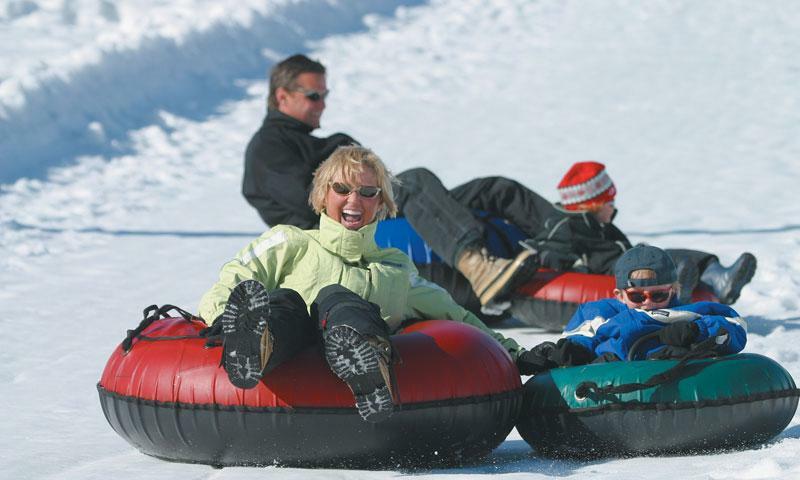 Snowbasin resort also has their own tubing hill. Check with the ski areas for hours of operation.